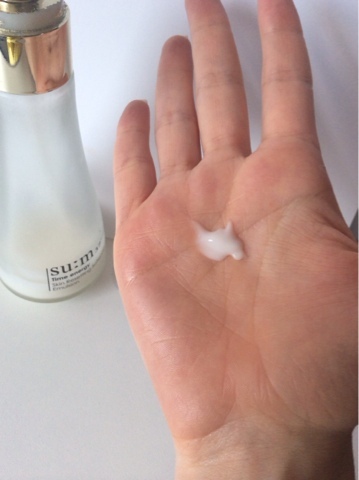 I’m finally reviewing a skincare product from one of my most beloved brand, s:um37. I have yet to find a s:um37 product that I don’t like, seriously almost everything wows me. S:um37 is young brand, established in 2007 by LG (other known brands by LG are Ohui, Faceshop and The history of Whoo). Its a high end brand department brand that specializes in fermented skincare. 'sum' means ‘breath’ in Korean, and the 37 is the optimal temperature for fermentation. So the brand name “su:m 37” captures the science behind it. The concept of ‘fermentation for skin’ has been there for a while now, starting with famous SKII essence. During fermentation microorganisms double active substances and break down molecular structure of substances to a size that is able to penetrate the skin more deeply and rapidly to boost the skin’s natural defenses. 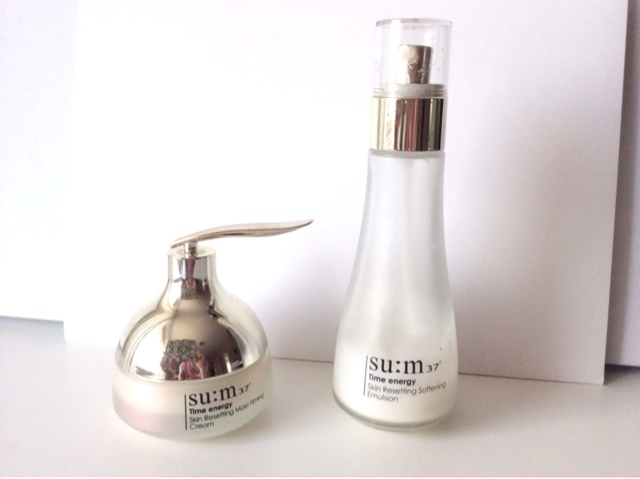 Su:m 37 differs from other brands fermented skincare in that it offers pure, naturally fermented products and not artificially, so no substance is added to induce fermentation. About 50 plant species grown organically in Hokkaido, a pristine area of Japan, are naturally fermented at a temperature of 37°C for 1102 days, or “3 years + 7 days.” su:m 37 is created using a fermentation technique studied for about eight decades by Japan’s Otaka Research Center, renowned for its research in fermentation. In the first step of this process, undiluted solutions of some 50 clean and pure plants are extracted and stored in a Japanese cedar keg in the Research Center for seven days. The extracted solution is moved to a storage area with a constant temperature of 37°C. It is left to breathe in tune with the melody of a music box while it is fermented dozens of times over three years. The process also produces new substances Zyen and Zyen-γ, which are highly effective at improving the skin. The Zyen and Zyen-γ, are naturally fermented substances, contain various amino acids, natural organic acids and antioxidants. Free of artificial fragrances, dyes and synthetic preservatives, su:m 37 delivers only the valuable effects of natural fermentation. I have tried many products from s:um37, but today I will be reviewing the time energy resetting softening emulsion. The sum37 time energy line is supposed to repair damaged skin and balance oil, so reset your skin and bring it back in balance. It’s perfect for my dry combination skin type. I have been using the emulsion and cream for over 8-9 months now. I have also tried the serum in some sample sachets (about 20ml). A review of the cream will be up later, no lets focus on the emulsion. I like layering skincare products, so an emulsion is pretty much an indispensable part of my skin care routine. 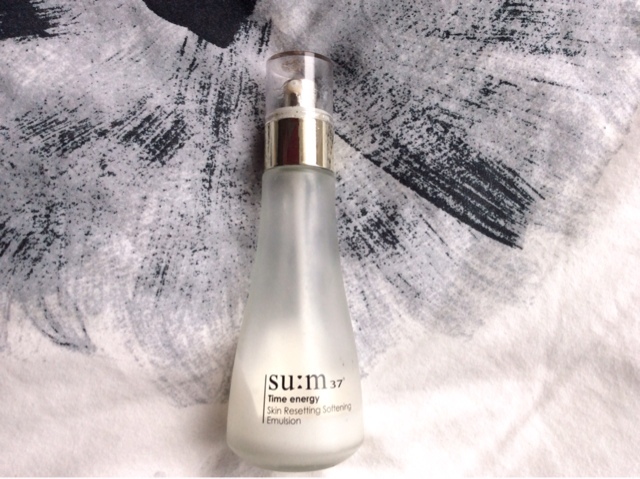 The S:um37 Time Energy Resetting Softening Emulsion is in one word just amazing! When I started using the sum37 time energy line my skin was at a bad place, dehydrated most of then time, and sometimes oily with active acne. I give the emulsion (and cream) much credit for improving my skin condition. I don’t want to make my reviews to long and unreadable so I decided to focus on the emulsion only , but I will review the cream in the near future. I don’t have the box anymore, I'm not sure but I think the ingredient list was only in Korean. You can find the ingredients on cosdna, its a long list just as expected: You can find Yeast and Lactobacillus that are used to facilitate the fermentation, Saccharomyces ferment and a cocktail of sum37 fermented extracts, like Watermelon Fruit Extract and Papaya Fruit Extract. There are some red flags, so if your skin is sensitive you should be careful, maybe start with samples. For instance, there is Cetearyl Alcohol and Citral (natural plant extract used as fragrance). I have a sensitive skin that and I dint experience any issues. Honestly, I don't have a problem with alcohol anymore, I realize now that the most important thing is the formulation. The product comes in a beautiful sturdy glass bottle of 130 ml. I just love s:um37 packaging it’s so luxurious and modern, the only downside is that its kind of heavy and not travel friendly. Still, I prefer such design to plastic, aesthetically very appealing. 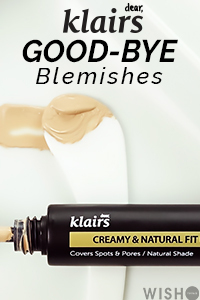 When applied it sinks into the skin immediately, without being sticky or oily, just leaving a glow and dewiness.What you see with many rich skincare lines is that they fail to control oil and make the problem even worse. Hence, for folks like me with dehydrate skin that can turn oily depending on weather and hormones, its always been difficult to find a skincare range that will mange to bring the skin in balance. That’s exactly what the emulsion did for me, I'm using it now for almost a year consistently and can see the long term benefits. Fine on my forehead are less visible, oil production in balance, no more active acne and skin is very hydrated. I have also noticed that it reduces redness and slightly brightens up skin tone. I cant rave enough about it, the sum37 emulsion is awesome! it has really delivered on its promise; resetting the skin balance, hydrating, softening and controlling oil. I do believe in the benefits of fermented skincare, and s:um37 is particular attractive with all different the microorganisms and raw materials used for fermentation. Now, I want to start talking about all the possible benefits of fermented skincare, but I I will do a more science orientated post later. 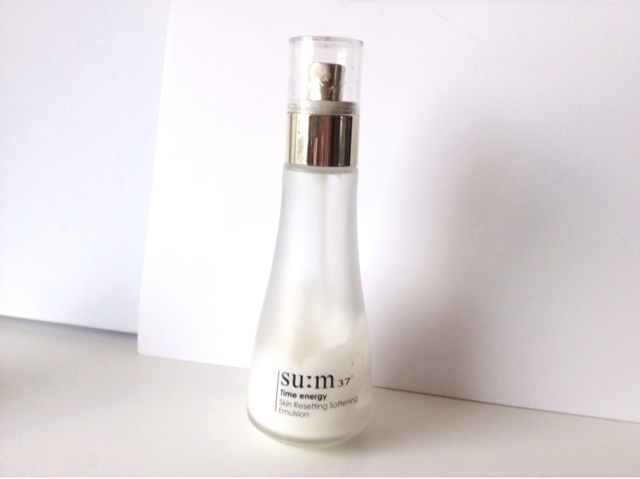 The emulsion works perfect in harmony when used together with the sum37 time energy cream, but this is also for a later post.